Zoom in close enough on a section of your brain and you would see a dense network of cells. The cells that create brain activity are called neurons, cells which carry an electrical signal from one to another.Neurons are the building blocks of the brain. Each neuron connects with up to 100,000 neighbours in the worlds biggest cuddle! To the naked eye, neurons appear as the “grey matter” of the brain. A piece of brain the size of a pin head contains approximately 60,000 neurons. Each of the neurons has a cell body. From the cell body project long root-like fibres. There are two kinds of fibre: axons and dendrites. Each neuron has one axon along which it sends electrical impulses to other neurons. Each neuron has a variable number of dendrites which have many branches. 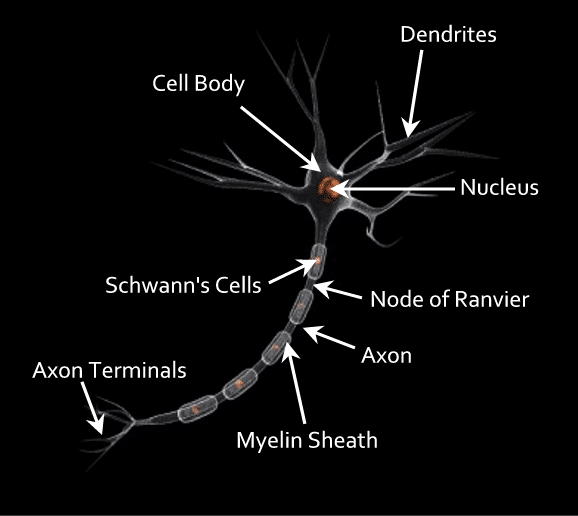 The axon from one neuron is attached to the dendrites of other neurons. The point at which they attach is called the synapse (we will explore this later in the tour). Dendrites bring information to the cell body and axons take information away from the cell body. This is the process of thinking. When you learn, have an idea, remember something, feel sexually aroused, communicate etc., your neurons are receiving and transmitting information throughout your brain. We will explore the thinking process in more detail later in the tour. The cell body houses the nucleus (which contains genetic code), and cytoplasm (which feeds the nucleus). Dendrites branch out from the cell body. It’s through the dendrites that the neuron makes electrochemical contact with other neurons by receiving incoming signals from neighbouring neurons. The myelin sheath is not continuous but is interrupted by the nodes of ranvier. The myelin sheath is a white fatty substance which insulates the axon and speeds up the rate of conduction of signals down the axon towards the axon terminals. The axon is a thin cylinder or protoplasm which projects away from the cell body and carries signals received by dendrites to other neurons. The axons make up the white matter of the brain. The axon terminals contain vesicles which release neurotransmitters across the synaptic gap. The nucleus contains the genetic code. Sensory Neurons – carry information from the sense organs to the central nervous system. Motor Neurons – carry information to muscles and glands. Interneurons (or connector neurons) – are connections between sensory and motor neurons. Interneurons are the most numerous neurons constituting about 97% of the total number neurons in the central nervous system. Some neurons are very short…less than a millimeter in length. Some neurons are very long…a meter or more! The axon of motor neuron in the spinal cord that innervates a muscle in the foot can be about 1 meter (3 feet) in length.